I spent much of today on the sawmill. It has been sitting neglected for much of this summer, and was therefor cranky about starting. I had to take off the air cleaner and pour gas into the carburetor about 6 times until it finally ran on its own. It was a sunny day but not to warm, and it was windy too. Wind can be two-edged when working on the sawmill. 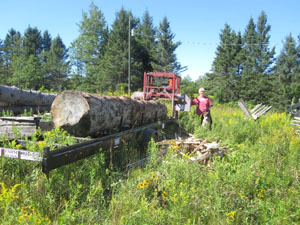 If it is blowing just the right way, the sawdust leaves the log and escapes away from the operator. I’ve had days when I’ve had to quit because of so much sawdust in my face when the wind blows just the wrong way. I got a bunch more 2x4s done for the garden expansion project today. I’d say another good 1/2 day on the sawmill and the rack will be empty of logs. If I calculated right, I should have enough of everything for the new garden fence once these logs are sawed up. This entry was posted on Sunday, August 5th, 2012 at 9:44 pm and is filed under Uncategorized. You can follow any responses to this entry through the RSS 2.0 feed. You can leave a response, or trackback from your own site.